We started off as ‘The Three Poets on Tour’ ­– meaning Chrys Salt, Liz Niven and myself. 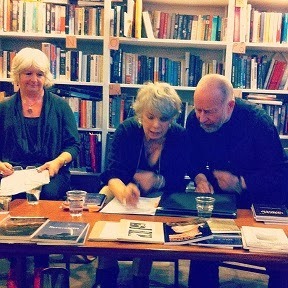 By the end we had grown like a rolling snowball, with poets Mike Horwood and Aila Juvonen added to our number. Now we were ‘Four Brits and a Finn’, and were designated as ‘A Cavalcade of Prizewinning Poets’. Amazingly, this mad whistle-stop tour of Finland, to the cities of Turku, Tampere and Helsinki passed off without mopes or mishaps. There was time to form relations with Finnish poets, journalists, literary figures, PEN members. There were many hugs, tears at the making of connections and the parting of new friends, and ­on many, many occasions, hoots of raucous laughter. Finns tend to stereotype themselves as a silent and gloomy people – ideal characteristics for writing about love and death, the eternal grist to the poetic mill. It may be no coincidence that Finland is a land filled with poets. But – as a long-term resident of Finland – I would say that the natural stance of Finns is one of understated wry humour, a kind of lightly-worn irony, accepting of the vagaries of life and of the fact that plans inevitably gang agley. That indeed is the attitude of the national epic, the Kalevala (from which Liz Niven read Scots translations), and it is an attitude that chimes wonderfully with the Scots temperament. This common way of embracing life may have been one of the factors behind the warmth of our reception. Also, there is the fact that in Finland, English almost has the status of a second rather than a foreign language. Thus, in a literary tour the barriers to comprehension are not that great, so long as the reader makes a few allowances in pace and articulation, and chooses themes that cross national boundaries. The appreciation of our audiences (many books sold!) and the generosity of our hosts was overwhelming. Particular thanks go to Kaarina Ojasti, Vice-Chair of the Federation of Finnish-British Societies and Secretary of the Tampere branch. With her practical good sense and the hospitality she offered at her home, small difficulties melted away like frost on a spring dyke; thanks also to Risto Ahti, multiply-awarded Tampere-based poet, critic and translator, and prime mover of Tampere Poetry Week (of which by pure chance we found ourselves part). And long Scots miles of thanks to Risto’s wife, Ritva Hokka-Ahti, who as well as being a warm and calming presence, was responsible for integrating many aspects of Poetry Week in her capacity as Information Coordinator. The Helsinki reading was notable for its large and distinguished audience, and for the attendance of Eeva Kilpi, Nobel-prize candidate, one of whose poems we read, adapted as a two-voice piece. Eeva (born 1928 and still fully active as a writer) is one of Finland’s most distinguished poets and novelists, a Nobel Prize candidate, and a national treasure. She talked to the poets afterwards, dispensing hugs accompanied by warm words of encouragement. I’d also mention a meeting with Marianne Bargum of Finnish PEN. Marianne is passionate and compassionate. She knows pretty much all there is to know about Finnish publishing and how poetry fits into it. But more importantly, she is a person committed to the ideals of PEN, and fully aware of the struggles of writers in an international context. Talking to Marianne reignites one’s sense of why writing is important, one’s anger at the difficulties and oppressions that many writers face, and one’s urge to do something to improve the situation. wiped away the smudges of the week from my mind. they read Eeva Kilpi in Donald’s translation. A lot went on in my head. I was present, for once. I spelt out my name to the women. who apparently is a fine fellow. he was keen to hear about my job. he decided I was one. not from the warmth, not from the cold. since I didn’t notice I’d already washed it. and I know what I want to be when I grow up. Sounds like a brilliant tour! I do like Pekka's poem too, especially where he says he washed his hair twice because he hadn't realised he'd already done it. And one of the best things that can come out of such meetings is the spontaneous translations such as this.